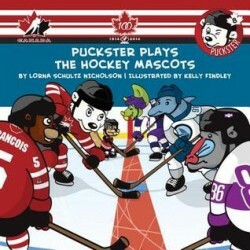 Puckster and his pals are playing against their hockey heroes – the Toronto Maple Leafs mascot Carlton the bear and the Montreal Canadiens mascot Youppi. These legendary NHL mascots inspired Puckster to play hockey and cheer for Hockey Canada. But when his drive to win and desire to impress others gets in the way, Puckster realizes that he has let his team down and forgotten the true spirit of teamwork. The important message of teamwork, this classic tale offers all fans of the game a lesson in friendship.